I turn 39 on the 28th. For the first time in my life, I’m not excited about my birthday. It’s not the typical existential dread of getting older. I like the wisdom that has come with age and am OK knowing that the remaining years in my life are dwindling. 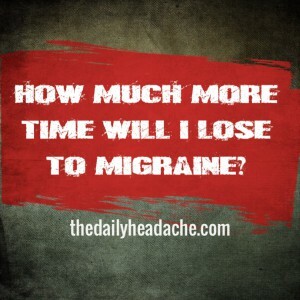 The distress comes from knowing that migraine will have an outsize role in determining how I spend those years. I have been housebound for nearly two months. Confined to the couch, I have to wonder: Will I have another six months of this then get back on track with my dreams? Or will I spend another decade trying fruitless treatments while science catches up with my body? Thinking of everything I’ve lost to chronic migraine—friends, work, school, hobbies, living in Seattle…—brings me to tears. But only one loss is a fresh bleeding wound whenever I think of it. Time. Time is the only thing I can never regain, repair, or replace. Approaching my birthday prone on the couch, I ask: How much more time will I lose to migraine? There is so much I want to do with my life. Writing to do, family to spend time with, friends to see and make, countries to travel to, bands to dance to. I don’t waste any minute of my time when I feel good (or even halfway decent). On those days, I go nonstop and crawl into bed at night satisfied and happy that I’m tired from exertion, not migraine. But those hours don’t add up to enough for me reach my goals. In January, I finally believed that the improvement I experienced in 2014 was real and lasting. I finally believed that I had enough energy and cognitive ability to bring the book I have in mind to fruition. In March, that belief was shattered. I know the book will happen, but not until migraine stops absorbing all my physical and mental energy. Will that be next year? Five years from now? 20? I have work to do. When will I get to do it? It’s a Dylan Thomas poem that’s probably familiar to you. It was to me, but the words hit me harder than they ever have before. As the main character begins to understand what the poem means to her, I considered what it means in my life. My 30s are nearly over and I don’t know how much more time I’ll lose to migraine. Now matter the number, the one certainty is that I will spend that time raging against the dying of the light. I’m still breathing, therefore I’m still trying to get better. I will not go gently. I cannot. I love life too much to give up. I am in to my 11th year of daily headache. I go to work and to worship service and occasionally to dinner or to the movies but I always pay with pain for the trip. My pain is so bad I dream about it. I have constant ringing in my ears. I am obese from inactivity. I tried diet, medication and yoga. Yoga has helped the pain in my neck and shoulders but its just not as painful. The nausea is the worst. No one can tell me why and I started having headaches at 13. This is the pits my life has just passed me by. I also frequently think of that poem in my darker moments. We played a piece wind ensemble piece based on the poem in high school, it has always stuck with me. I’m so sorry your condition has been worsening. I’m in an odd place my migraines have been improving, but my Meniere’s disease has been worsening. I’ve essentially been told I have an expiration date, sometime in the next few months to at most a couple years current treatment for my ear will stop working, and I will need to use something that destroys the nerve. In my doctor’s own words for me “it will be devastating”, mostly due to my migraines causing poor compensation for balance and hearing loss, and that poor compensation in turn will trigger migraines. It is hard to go day to day knowing that my current bad days will sooner rather than later return to being my good days. While chasing new solutions and treatments is exhausting and stressful, I am thankful when it gives me a piece of myself back, even if it is only for a little while. I have never had anyone else articulate exactly how I feel. I am 44, and confined to my bed much of my life. I used to have a very fast paced career working at my dream job in NYC and now my life is consumed by fighting against the pain most of the time. I know exactly how you feel. You are not alone. The only thing that brings me comfort is this: we do not know what is coming down the line: what new medications, new herbs, new modalites may be discovered. Hope is all we have. I can totally relate. I had a good year as well, it was 2012. 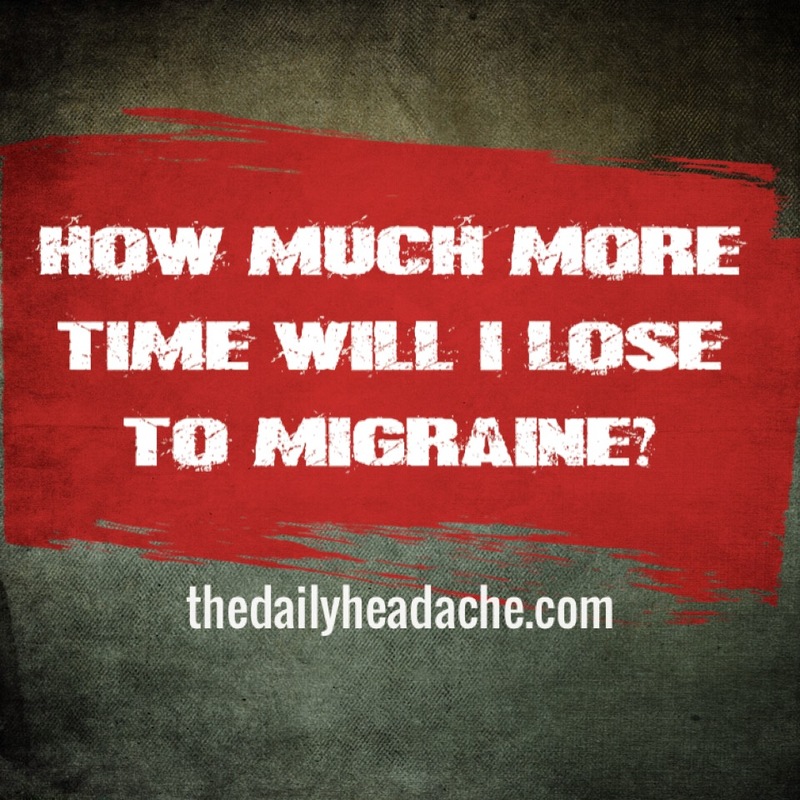 My migraines became so infrequent and the ones I had I could just pop an Exedrin, and they would go away within an hour, that I stopped my food diary and my regular journal thinking I was cured. The migraines came back in 2013, but it wasn’t until this year, that I started to suffer from really bad migraines and now they are frequent again. I’m trying to remember what I was doing in 2012, how I was feeling, what was my mood like, what was I eating then? I was on a very healthy diet back then, and over time I let myself slide eating questionable foods, and having some beer and wine at times. I think that’s what happened with me. I got better and I forgot about my migraines but my migraines didn’t forget about me. I stopped reading nutrition labels on the foods I was buying, I stopped my gluten free diet, I stopped taking a lot of my supplements, stopped making all my meals at home from scratch, I stopped drinking my daily green smoothie. And now I have to come to terms that there is no cure for my migraine, but as long as I eat healthy and avoid certain foods – basically deprive myself off everything I really like to eat – I can live migraine free, but sometimes I ask myself, is that even living? I’m going to a friends wedding this weekend and I’m already worried if I will be OK to go. And what will I eat at the wedding since there is so much can’t eat. And even though it will be open bar, will I have enough will power not to have that glass of wine with my dinner. Happy Birthday, Kerrie. I know this birthday carries a lot of mixed feelings for you, and I’m sure many of us can completely relate to those feelings. But please know that the work that you do on this blog, and the support that is provided through these shared experiences is meaningful and has already made a difference. Thank you for doing what you do and being who you are. I hope that today is manageable for you. I feel the same way Kerrie. I’ve had constant daily headache (chronic migraine) for 11 years 6 months and tinnitus for 10 years 10 months. I’ve effectively lost my entire 20s to pain and noise in my head. My problems started aged 20. Ive now lost the first 2 years of my 30s. Im so debilitated I have to go to bed every day for hours. My mood, sleep, appetite, motivation, concentration, social life and quality of life are all destroyed. The only treatments that are likely to work are surgical in my opinion (good luck getting that on the NHS in Scotland). I’m trying to get enrolled in a clinical trial of high cervical spinal cord stimulation for chronic migraine at guys and st thomas hospital in london and its the same old bloody story. A million hurdles because im in Scotland with doctors who don’t support surgery. Hi. I’ve had chronic migraines since 2000. Time does disappear, it feels like yesterday that it was going to be the year 2000, and at that point I was migraine free. Now I am like many of you, in bed all day, having lost many friends and all of my social life. Going to restaurants is impossible- too loud, too smelly, too everything! Have you read this article yet? http://news.yahoo.com/migraines-may-begin-deep-brain-145254082.html. Blocking a single neurotransmitter in the brain may stop the firing of nerves that are linked with migraine. Just wanted to let you know that I’m still thinking about you and sending good thoughts your way. I hope you are getting the support you need from your friends and family. So sorry to hear you are in so much pain. Glad to hear that you that you love life and won’t give up. I hope you get some relief soon. Hope you had a good birthday in spite of the persistent pain you’ve been experiencing. I don’t mean to wade into this thread ‘half cocked’ as it were but have you fully exhausted the natural approaches to controlling migraines that are out there? My husband used to be sofa bound with crippling migraines until we started experimenting with the more natural, holistic side of things. He used to dismiss it at first, citing ‘hippy mumbo jumbo’ amongst other things but I persisted and the pain and onset began to subside. It seemed that in his case he had a Manganese deficiency which would trigger them. After adjusting his diet and through trial and error supplementation found that the Manganese supplements where the remedy he was after. Through witnessing his well, metamorphosis is probably the most apt term, over a few short months my interest in more natural approaches has blossomed to the point where by I’m a qualified nutrionist, opened my own store and am my continuing my study in this area up to a Masters level.